Can I tell you a secret? We don’t use a live Christmas tree in our home anymore. 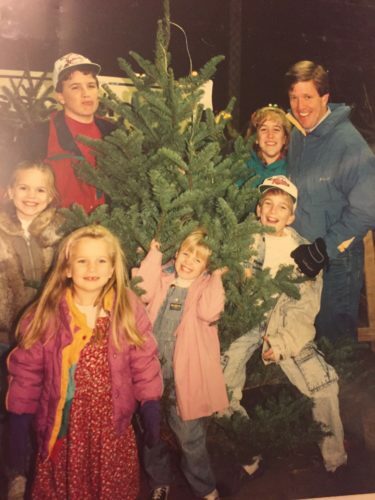 For years when the kids were younger, our tradition was to pick out a real tree together. Dennis held different trees out, pounding and shaking the branches open, measuring height, talking about which loose twigs to trim. It really was a dreamy holiday tradition, chalk full of regular, everyday family squabbling and needs. But a few years ago, we decided that was too much work for us empty nesters. We have since resorted to an artificial tree. So I’ll let you in on another secret: I’ve had that dazzling fake Christmas tree up since this summer. It’s not quite as bad as it sounds. We drug it down from the attic, assembled, fluffed, and dressed it for our Christmas photo shoot in July. Because we put together a lovely Holiday Catalog for you, and that meant pictures had to be taken early. I wasn’t sad about it at all! Dennis and I talked about folding the tree away again until Christmas season (or at least November! ), but instead we chose to slide it into our mostly now-unused playroom. Every now and then I go in to get a peak of the beauty and glitter of Christmas. Even a glimpse sends me longing for the fast approaching holidays. Since we’re all there collectively now: hoping for cooler weather, pinning sugar cookie and cocoa recipes, marking calendars with forthcoming festive dates, it’s time that I show you my home, decorated for Christmas. You likely saw the just-released Holiday Catalog, but I don’t have the space there to include all the fun ways to use the beautiful and meaningful decor. Here’s a look at other ways to spruce up your home this Christmas. I’m going simple with my front door this year. Our home is tucked back into the trees down a long private drive so no need to string the rooftop with lights. 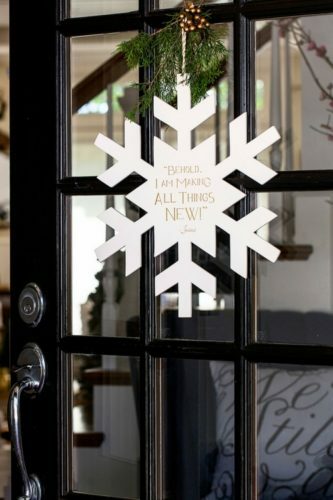 My guests will be greeted with our new Snowflake Door Hanger. I cut a pine sprig from my yard and looped a pine cone on the twine hanger too. What I love most about this piece is that when I’m sadly packing away my holiday decor at the end of December, I’ll be able to leave this in place. It can glisten its way through the entire winter season. Most of my visitors, when they come inside my front door, head straight to the kitchen by route of our dining room. 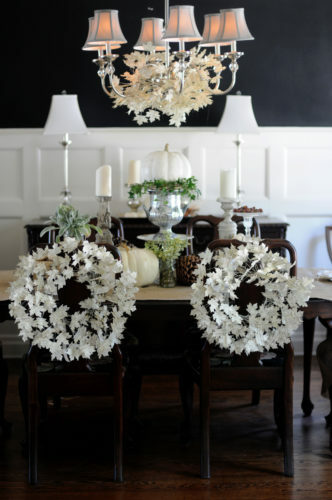 I like to have the dining room looking festive, even for everyday decor too. Dennis and I eat at a tiny two-person table tucked in the living room, but seeing this dining room table all set brings me joy in memories of our kids around it and excites me for holiday visitors who will be here soon. This is the look from the entryway. You can see three Leave Him Thanks wreaths: two secured onto the chair backs and one laced around our chandelier. 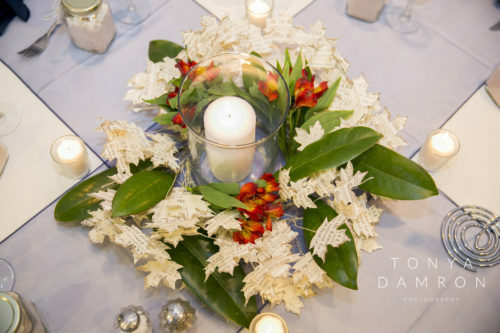 The white glittered leaves are classic for pairing with Thanksgiving and Christmas decor. I currently have white pumpkins and pine cones on top of the burlap runner. 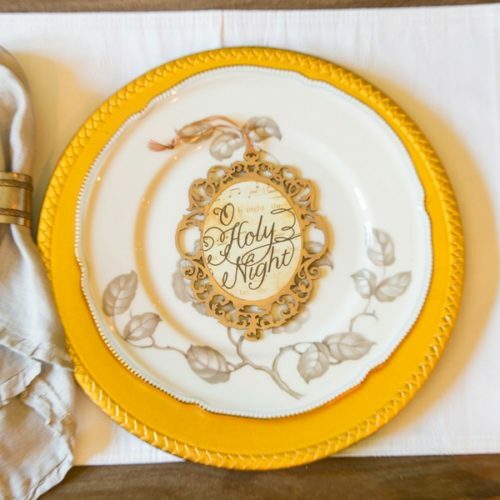 For my Christmas table, I use AdoreHymns as part of each place setting. In some years we’ve chosen to listen to or sing each hymn that is at someone’s plate. 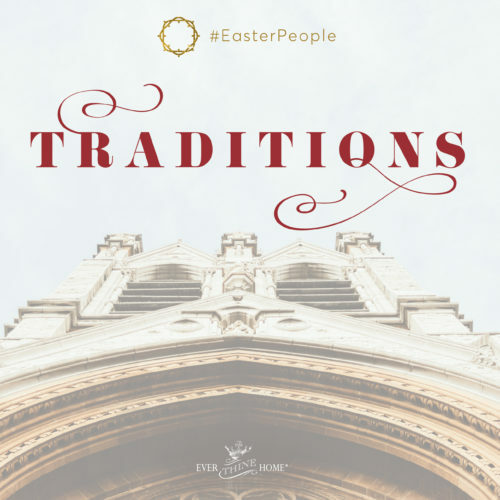 Our family is far from musically gifted but it can be a fun tradition anyway. Of course, our living room is the main hub of holiday festivity, so it’s my favorite area to bring to holiday life. We have a windowed corner, complete with a cozy cushioned seat. That’s where we put our tree each year. The morning light floods through making the glittered ornaments dance in delight to our King. This year, I’m excited to drape our new tree skirt around the bottom. 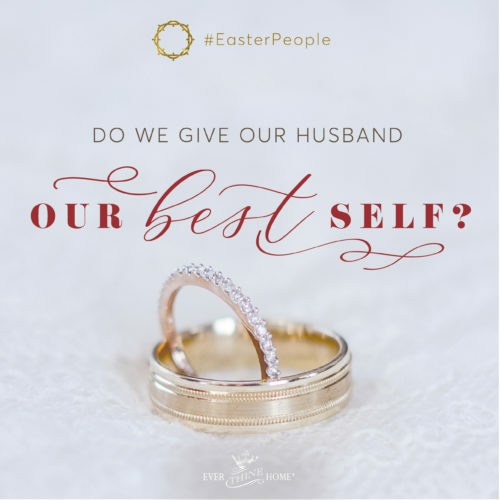 We love that it’s imprinted with the verse, “Every good and perfect gift is from above” (James 1:17). This is the perfect spot to fill with gifts! 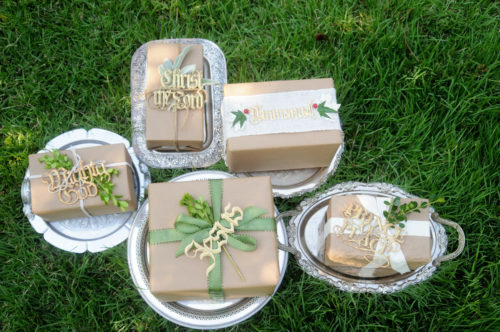 Have you seen my last few year’s gift wrapping? I wouldn’t have done this as a young mom, but I do enjoy now having the packaging tie into the whole tree’s look. So I’m pulling a few pieces from the tree and using it as a little extra happy for the packaging and gift. It’s a fun way to gift someone an ornament, and it’s a nice way to pull the full look together. Use basic butcher paper. Be sure it’s thick enough that it doesn’t tear. I like brown, but you could also try white. Here I tied His Christmas Name ornaments individually with green ribbon or twine. Pop in a piece of greenery for full effect. 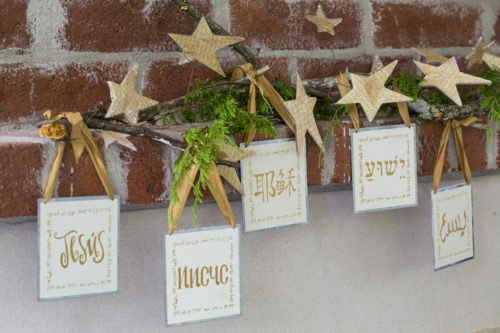 You can also use our Bright Morning Star Garland as a gift wrap accent or His Advent Names work well, too! 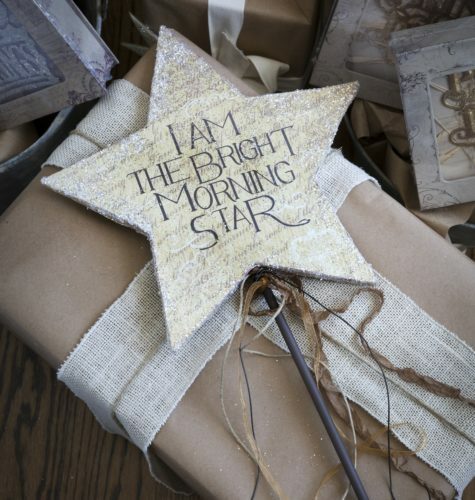 For a hostess gift, or little special extra, try lacing on the Bright Morning Star Tree Topper to the top of a larger gift! 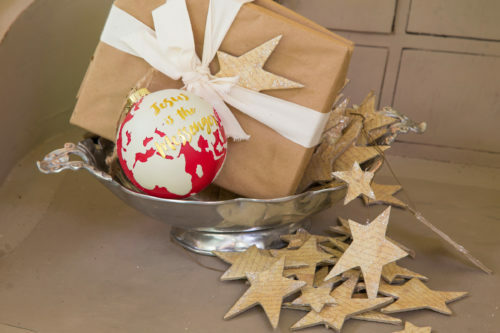 I’m still loving the handpainted Advent Globes we debuted last year and shimmery star garland. Here’s a closeup. See how pretty an artificial tree can be? But don’t confine your ornaments to only hanging on the tree. 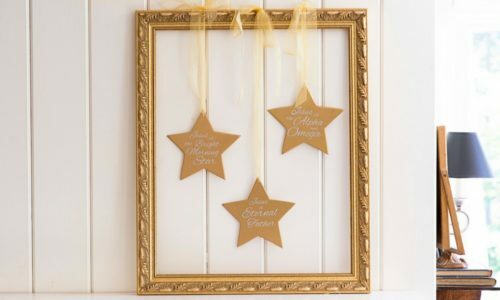 We had this idea during our photo shoot, and I fully plan to prop His Eternal Names wooden stars on my mantle inside a classy gold frame. 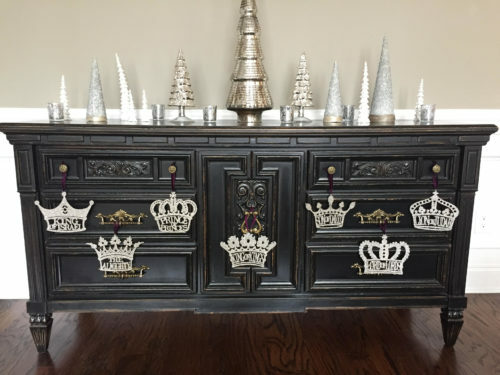 Here’s an idea from my friend who hung the silver glittered His Royal Names against a black painted buffet. 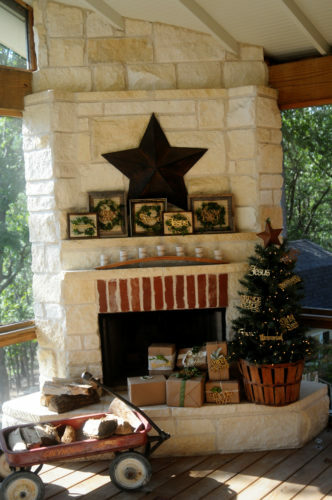 The contrast is nice, and she added a reverent reminder of Christmas to another area in her home. I added His Name Among the Nations to a fallen backyard branch, with our Star Garland again (see how many places you can use it?). You can add it to a mantle or bookshelf! One of my favorite spots in our home is our screened in back porch. It can be cold during the Christmas season, but some nights Dennis will build a fire and we’ll drink a cup of coffee under blankets out back listening to the stillness of God’s creation. I love to bring holiday beauty to this space, too. I have a small tree out there that I reserve for His Christmas names. I carry the theme through by framing several of the same ornaments for the mantle. 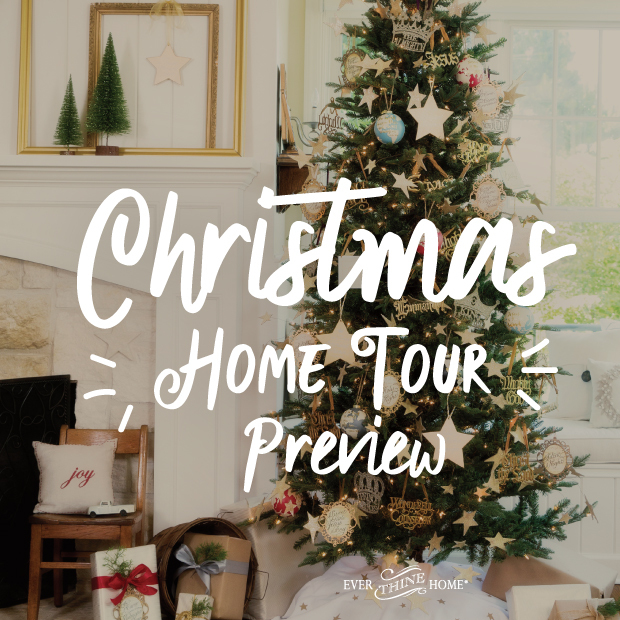 The mixing of textures with the shiny gold ornaments against the white crackled rock with the pop of red brick feels like the perfect illustration of our precious baby Savior’s arrival on this earth, destined for the red blood of the cross. 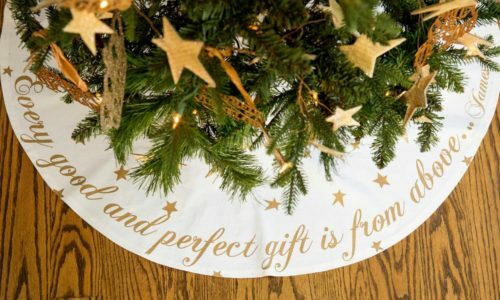 I hope that these pictures throughout my home have inspired you to grab some meaningful pieces and ready your home for holiday worship of the one who came that first Christmas morning. If you’d like to check out our Holiday Catalog to get any of these on their way to you in time for tree trimming, you can view it here. How grateful I am to find a way to write you about my joy and thankfulness using the “His Name Among the Nations” ornaments. I first used them on our tree two years ago. 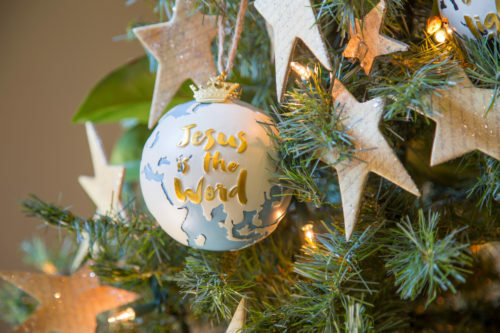 As they hung amidst the evergreen branches attended with lights, they proclaimed the lovely name of Jesus to friends and family at home and around the world. When our son came home for Christmas from studying Arabic in Lebanon, he recognized immediately the name of Jesus in his new language–and was so happy to see it. Our son-in-law and daughter spent part of their holiday visiting his parents who were born in the Dominican Republic. Yes, I sent my best picture of the hanging Spanish ornament to his family with all of our love. Our eldest daughter, with her husband and children, went to California near Christmas-time and who should she see but a former Russian roommate from college. She sent the friend’s picture home and said, “Guess who?” I responded with a picture of our hanging Russian ornament which the friend loved so much. This inspired me to send a pic of the Mandarin ornament to one of our dear young friends studying Mandarin in China. At that point, I knew my pastor would appreciate the Hebrew ornament and sent a picture with holiday greetings to him and his wife. Sometime I must share with you my pictures of the ornaments gracing our Christmas tree. How I love the memories and meditations they bring, and how I appreciate your reverence for His holy name. Thank you EVER so much. Gail, I love hearing these stories of how you shared ‘His Name Among the Nations’ with so many internationals and globally minded friends and family. It’s exactly why I created these ornaments with the name of Jesus in other languages. Truly He is God’s gift to the whole world that whoever believes in Him shall have everlasting life. I pray others will follow your example! Just beautiful! 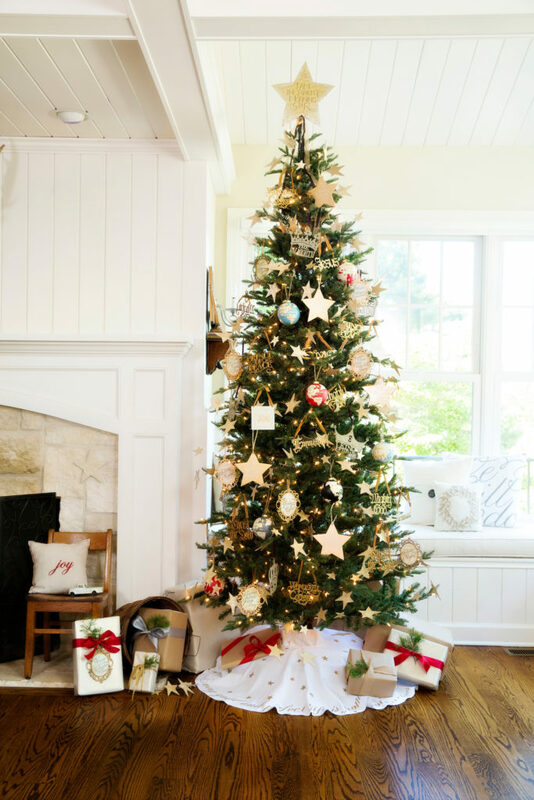 I am more excited for the holidays this year after viewing your home. Thank you for sharing. Beautiful! Love all the true Christmas ornaments. Would love to see you offer Jesse tree ornaments. I have been trying to collect them but many just aren’t available, i.e. coat of many colors, scroll, fiery furnace, Bethlehem silhouette to name a few. And selling them individually and as a set would be perfect! Thank you for the delightful tour through your beautiful home, generously sharing your beautiful ideas. I feel like your my “sister from another mother”; your way of expressing your faith so elegantly is also how I enjoy honoring our Lord! Until I saw you doing things so beautifully, I almost wondered if I gave too much attention to details like this, but it really is God’s gift of creativity and my way of worshiping. Now I feel validated in honoring God in this way, and hope my guests feel blessed by it. 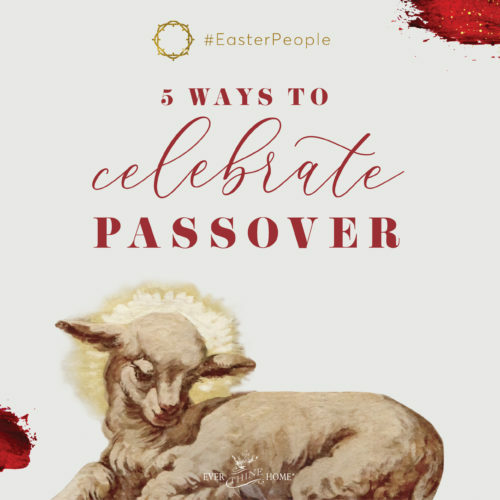 Blessings to you and your family!